Have you ever felt stressed, anxious, overwhelmed? Do you suffer from an overactive busy mind? Could you benefit from being able to focus more? Then stay tuned as I share a very simple technique for how you can naturally get out of your own head, be present, relax and clear your mind. Through my years of working with countless clients, I’ve helped a number of people who suffer with stress, anxiety or people who just need to focus and relax more. This simple technique I’m going to share with you is probably the most effective technique I’ve shared with clients over the years. It’s so easy, but please, please don’t overlook it for how simple it is. This technique is a breathing exercise, a breathing exercise that I call focus breathing. There are many different techniques out there, but this one is so simple and effective and easy to do. The first thing I want you to do, is to simply focus your full attention and awareness on your breathing, it’s something that is happening already, but just tune into it and become aware of your breathing and that alone can help you to relax and unwind. But there are a few things you can do to take it to another level to make it even more effective for you. The next thing to do is to imagine every breathe almost like a circle or a figure of eight, something that is continuous with no end to it. Make it so the in breath is half and the out breathe is the other half. The aim is to just make each breathe as slow and as comfortable as you possibly can, and just keep doing that for a few moments, just in and out. This on its own, is going to help, but another way you can just take it up a level and give you extra focus is to count in and out for the same number with each in and out breathe. Personally, I count in and out for 8, as I think of each breathe as the figure 8. the number is not important, as it depends how fast you count. The key is to ensure you count in and out for the same number. So just pick a number that works for you and on each breathe count in and out for the same number. This just helps get the pace, speed and tempo right for you. Now if at any point during this your mind starts to wonder or you get distracted by something, don’t fight it or give into it just acknowledge it and accept it and as soon as your ready just bring your attention and your focus back to your breathing again. That’s one of the reasons why this simple easy breathing exercise is so effective, is because you can do it anywhere. As long as you’re alive, you’ll always be breathing, so you can do it anywhere at any time and if you get distracted you can always take your attention back to your breathing again. Now to take it up another level, I want you to think of a word or a phrase that symbolises to you, how you would like to feel. It could be something obvious like calm, confident, relaxed, happy or comfortable, it just depends on what context you are using this technique for and how you want to feel. Then, once you have chosen your word or phrase, focus on it, say it to yourself on every in breath, simply say it to yourself in the privacy of your own mind, picture, image, reflect on your word or phrase and what it means to you. So, as you focus on the word, it’s almost as if you’re breathing in more of the feeling that goes with that word. Then on the exhale imagine you are letting go of what you don’t need. The idea is to focus and breathe in the good feeling and exhale and imagine letting go of what you don’t want or need, for example stress, tension, worry, anxiety, negativity. Just the same way we do naturally and automatically, we breathe in the new fresh air, take on the oxygen we need and we exhale, release and let go of what we don’t need. In its simplest form it’s called focus breathing, because all you have to do is focus on your breathing and I’ve shared with you a few variations to help enhance it and make it even easier for you. Depending on how busy your mind is and what you are thinking about at the time, you can choose which variation is best for you. But like I said earlier, it’s so simple and easy, but please, please don’t overlook it for how simple it is. There are two core reasons why this technique can be effective for you. Firstly, when you are breathing more effectively and efficiently your body is going into its natural relaxation response and it’s impossible to be stressed, anxious, worried, fearful and relaxed. You can be both together, so the more time you take to focus on your breathing, to be present in that relaxed state, even if you don’t feel it straight away it will be having a potential benefit to you. 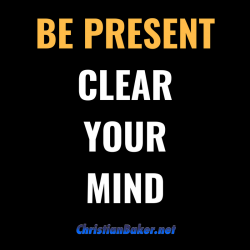 Secondly, while you are in the present focused on your breathing, you’re not thinking about the past on the future you’re just allowing the headspace to get out of your own head and be present in the here and the now, just being mindful in the moment you’re in, the power of now as it’s sometimes called. So, the more you can get out of your own head naturally and come to your senses and be in the here and the now, the more beneficial it will be for you and the more effective you can be in your life. Now I’ve shared that with many clients from professional athletes who use it to help get them focused, to get in the flow, to be in their zone ready to perform, as well as musicians, actors, singers people who perform live on stage or in front of the camera. As well as people getting themselves read to go into interviews or exams, or people just during day to day life to help keep them balanced and focused. So, there you have it, my overview of a very simple, easy, yet very effective breathing exercise which you can utilise in your life. Please leave me a comment below the video, letting me know how and when you can use it in your life and make sure you practice it as often as you can. Don’t do it once or twice and expect it to have a massive impact, but the more frequently you do it, the more beneficial it will feel and be for you. So just do it, have a go, it’s free and unlimited and just see what impact and benefit it can have for you. And remember – What your mind believes you will achieve, so allow yourself to think differently, to believe in yourself, take action so you can achieve the life you want!